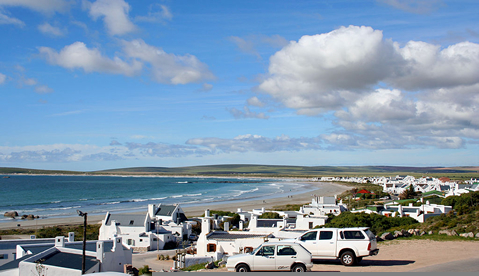 Paternoster is a sought after tourist destination and is known for lobster and the white-washed fishermen’s cottages. The remarkable coastline of jagged cliffs and white boulders makes this one of the most beautiful beaches on the West Coast of South Africa. The area has an array of interesting sea and wildlife to observe. Activities include whale, dolphin, seal and penguin watching as well as bird watching with over 225 bird species in the area. Sporting activities range from kayaking, kitesurfing, snorkelling, scuba diving, kite flying, hiking, and for the brave – swimming in the cold West Coast water! During spring the area is transformed into a floral paradise, with wild flowers growing everywhere forming the South-Western fringe of the famous flower carpets of Namaqualand. Visitors can pay a visit to the Cape Columbine nature reserve. The reserve covers an area of 263 hectare along the rocky stretch of coastline. The bay, which is part of the reserve, has many picnic spots and braai facilities. Cape Columbine light house is the last manually controlled lighthouse in South Africa. The lighthouse was built in 1936 on Castle Rock. The light cast a beam which is visible from about 50 km and is usually the first South African lighthouse seen by ships coming from Europe. Bantry Bay, Bellville, Bloubergrant, Bloubergstrand, Brackenfell, Camps Bay, Cape Town Central/City Bowl, Claremont, Constantia, Durbanville, Fish Hoek, Fresnaye, Gordon's Bay, Green Point, Hout Bay, Kenilworth, Lakeside, Melkbosstrand, Milnerton, Muizenberg, Newlands, Noordhoek, Observatory, Parow, Paternoster, Pinelands, Rondebosch, Salt River, Sea Point, Simon's Town, Sir Lowry's Pass, Somerset West, Stellenbosch, Strand, Table View, Tokai, Tygerberg.